Right now I have a ladder in my bedroom displaying an old quilt. I purchased it at a yard sale a few years ago for $10. Both my mom (who had to come pick it up for me because it wouldn’t fit in my tiny Ford Focus) and the woman having the yard sale thought I was crazy for wanting such an odd, beat up piece but it has become one of my favorite decorating items. Sometimes there are things that catch your eye but no one else’s and these normally become the pieces that everyone eventually wishes they had purchased instead of you. 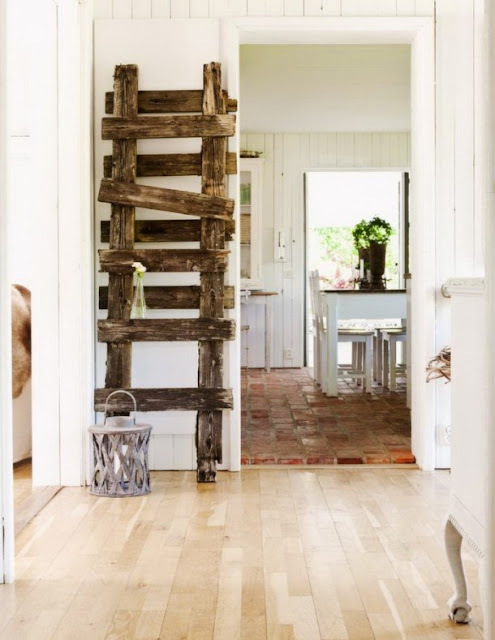 This type of ladder would also look great in the bathroom displaying towels. I also have an old step ladder that I bought at a flea market. It was just plain, aged wood and I wanted to make it a little more special. I rubbed all the edges and the metal hardware with clear candle wax. Then, I painted it cream and sanded the areas that had been coated with the wax to distress it before staining the piece. This kind of ladder can work perfectly as a side table or as a place to display small items. I see ladders being used in so many different ways. My favorite looks use ladders that are old and worn. Imperfection gives so much character to pieces like this. 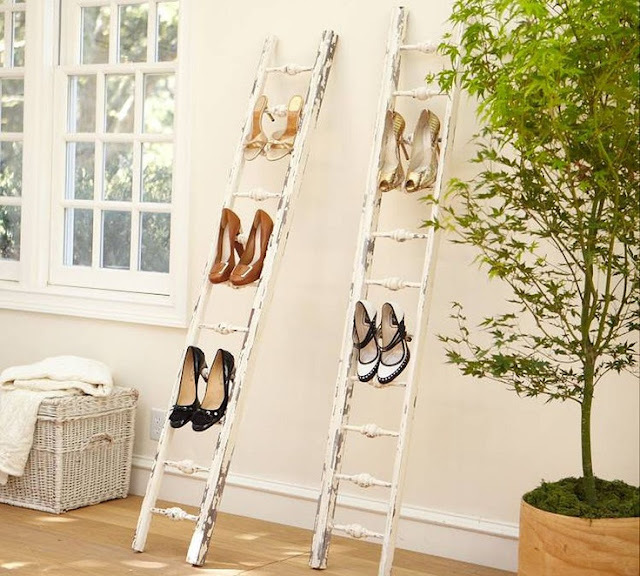 This picture from Pottery Barn a ladder displaying shoes. I love the chipped, white, painted finish on the wood. This could be recreated with an old piece of architectural trim. 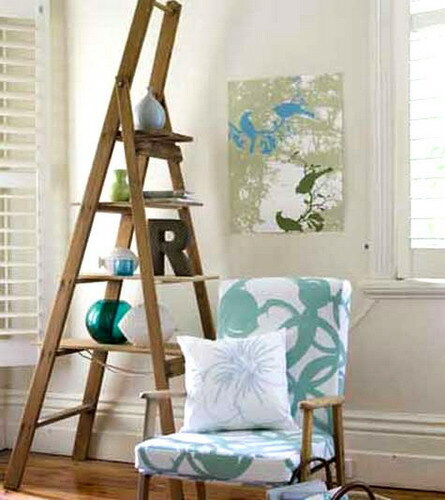 A ladder can be used hung on the wall to hold pictures and other small items. It brings your attention to all of the smaller items that would typically be lost on a big wall. 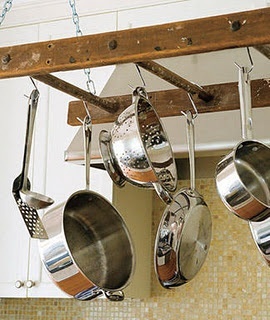 In the kitchen, a ladder can be hung from the ceiling to be used as a unique pot rack. Lighting or lanterns can be hung from a ladder. 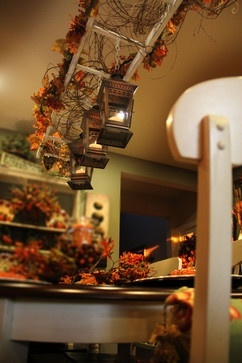 Wouldn’t this be nice outside over a dining area? 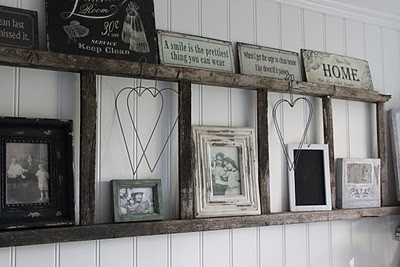 Adding wooden boards on the rungs of a ladder turns it into an interesting display shelf. 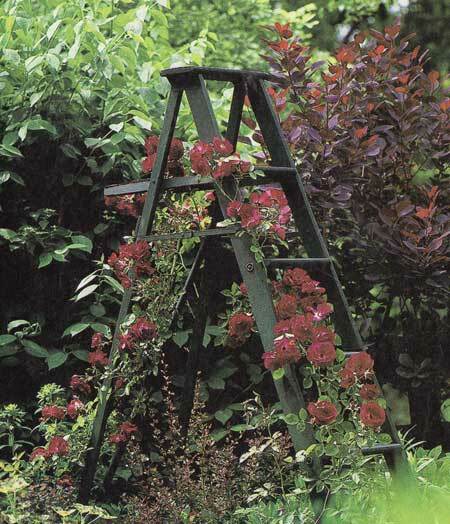 In the garden, a folding ladder can be turned into a trellis giving flowers a place to grow. And finally, sometimes a ladder can stand all on its own in a room and needs no other purpose than to just fill up a wall.